All of the old, autocentric stereotypes about Los Angeles have been driven into submission in recent years by the rapid expansion of a regional rapid transit network made up of subway, light rail, commuter rail and bus rapid transit lines. The pace of L.A.’s transition has been a wonder to behold: The Blue Line between Downtown Los Angeles and Long Beach, its first rail line of the modern era, opened in 1990 (the last days of the old Big Red Car interurbans were immortalized by Hollywood in Who Framed Roger Rabbit?). Green, Red, Purple, Gold and Expo Lines followed, and by 2016, the Metro Rail system was 106 miles long, with 93 stations. This has been accompanied by the Silver and Orange BRT lines, and the Metrolink commuter rail system now spans 388 miles. Projects in the pipeline will get Los Angeles, if not to global metropolitan standards for transit mobility, then at least to a place where reasonable numbers of residents can go without cars with some sense of freedom. This is basically a better version (at least according to me!) 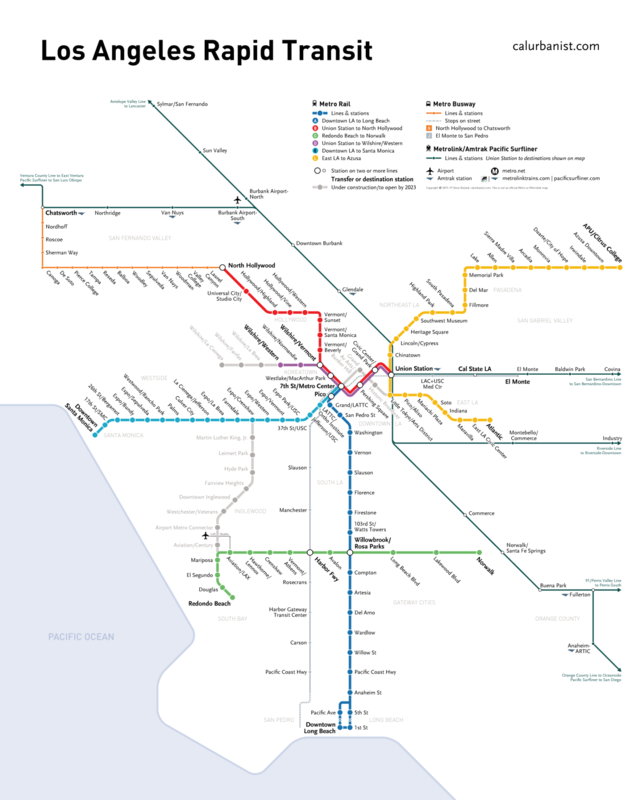 of Metro’s official rail and BRT map; like my BART map, it borrows heavily from the official version (including Metro’s official typefaces of DIN and Scala Sans), but it cleans up elements I don’t like, including the awkward diversions from geographical accuracy. Metro’s in-house branding, by the way, is the gold standard in the industry.